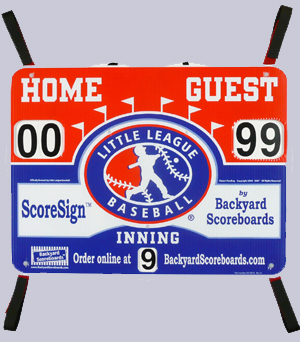 Here is a great way to keep the spectators and players informed of the score at your next Little League baseball game. The officially licensed ScoreSign (TM) is a small, lightweight and portable scoreboard that easily attaches to almost anything using Velcro straps. Great for the backstop or baseline fence. Easy to use score wheels display each team's score, from 0 to 99, in large easy-to-see numbers. Also shows the inning. Lightweight and portable so that you can easily carry it with you to each or your games. Made from durable all-weather, waterproof materials. Size is 18" high by 24" wide. Weighs less than 3 lbs. Patented.